Pink Floyd news :: Brain Damage - Pink Floyd release new Marooned video...and TDB20 countdown! 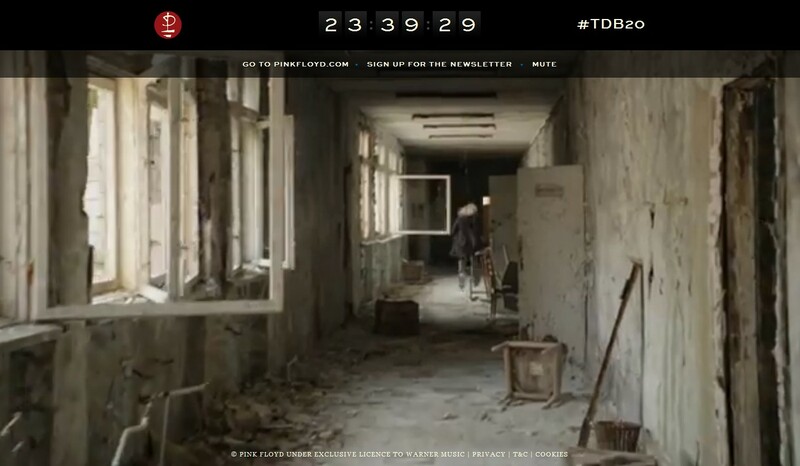 Pink Floyd release new Marooned video...and TDB20 countdown! For those who have been following the intriguing images on Pink Floyd's Facebook and Twitter, three of which have appeared with no explanation other than a #TDB20 hashtag, this afternoon a major update has occurred. Accompanied by the same hashtag is a link to a new site - www.DivisionBell20.com. This is running, on a loop, a new promo video for Marooned - and a fascinating video it is, too. Rather than whales or similar, the start of the promo uses stunning International Space Station footage of the earth. Half way through, this shifts to a very much earthbound location - the city of Pripyat, in northern Ukraine, once home to 50,000 people, but now known as the ghost-town on the doorstep of Chernobyl following the tragic accident at the nuclear reactor in 1986. This is an eerie journey through corridors and buildings and does compliment the track well. At the top of the page is a countdown, which seems to be heading for 3pm UK tomorrow (Tuesday)... we'll keep you posted as to what transpires. There are plenty of rumours, but it seems tomorrow we'll know for sure!